Dicaearchus of Messana (fl. c. 320 b.c.) was a peripatetic philosopher. Like Theophrastus of Eresus, he was a pupil of Aristotle. Dicaearchus's life is not well documented. There is no biography by Diogenes Laertius, and what the Suda offers is meager. However, it can be ascertained that a close friendship existed between Aristoxenus and Dicaearchus as both are mentioned as personal students of Aristotle. Dicaearchus lived for a time in the Peleponnesus, and in his pursuit of geographical studies and measuring mountains, he is said to have enjoyed the patronage of kings. Dicaearchus's interests were in certain respects narrower than Aristotle's. There is no evidence that Dicaearchus worked in logic, physics, or metaphysics. To the contrary, his work On the Soul recalls the Aristotelian treatise of the same title, but Dicaearchus's work was not an esoteric treatise. Instead, it was a dialogue in two parts. His interest in good and bad lifestyles also found expression in works such as On the Sacrifice at Ilium, and On the Destruction of Human Beings, in which he presented man himself as the greatest threat to mankind. In On Lives, a work of at least two books, he considered philosophers and others noted for their wisdom, with his main thesis being the superiority of the active life over that of quiet contemplation. Cicero speaks of controversy between Dicaearchus and Theophrastus the former championing the active life and the latter that of contemplation. Circuit of the Earth was a work of descriptive geography in which Dicaearchus said that the earth has the shape of a globe. This interest in earth's sphericity led him to make maps and discuss other phenomena like the cause of ebb- and flood-tides and the source of the Nile River. The largest number of texts in the collection deal with cultural history, most of which stem or appear to stem from his Life of Greece, while the smallest section deals with politics. 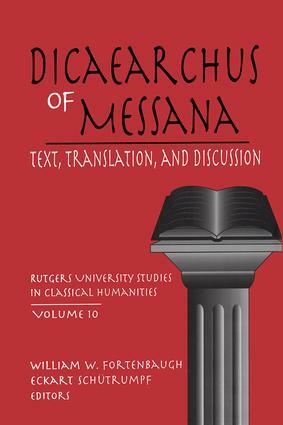 This tenth volume in the series Rutgers Studies in Classical Humanities includes a facing translation of the Greek and Latin texts, making the material accessible to readers who lack the ancient languages, and the accompanying essays introduce important issues beyond the scope of the text.